Conspicuous from the new header I bought and clicked the season's first pumpkins.The markets are filling with these gorgeous antioxidant rich fruit,how could I not pick one?. I ignored them in the past but not anymore.This is just my second year of cooking with pumpkins and I have lot of recipes to try with them ,so expect to see some of my favorite pumpkin dishes this season. 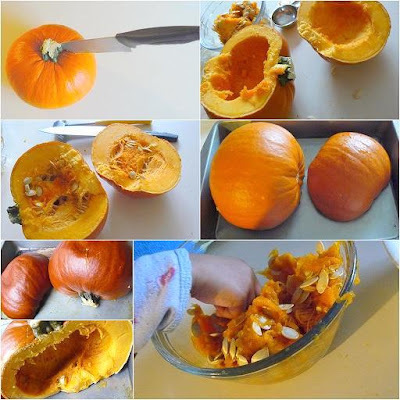 I find the cutting part particularly challenging,while some smaller variety can cut through with sharp knife,perhaps I did not have the muscle power for this particular pie pumpkin I also needed a hammer to pierce the knife in.Here is the complete procedure to make a pumpkin puree.And the seeds are real treasure ,don't trash them. The first favorable dish with pumpkin is undoubtedly the PIE.Remember last year's eggless Pumpkin pie,light and lesser in calories.This season I baked with the Organic eggs ,relatively(25%) less in saturated fat,of course if on no-eggs diet one can always use the egg substitute. Surprisingly I had a little helper in the kitchen.Unlike his elder brother he is always anxious about what's cooking.Helped me separate the seeds from the pumpkins and whisk the eggs for the tarts.I couldn't be more pleased.He loves anything chocolate,the mini portion also suited him just right. Using a food processor pulse together the flour,salt and butter while adding the cold water to a smooth dough consistency. Or use 2 fork and break the butter in to flour and mix it up while adding the cold water. Spread some all-purpose flour on the work surface.Unwrap the dough using a rolling pin, roll out half the dough and using 6 inch cutter or round lid of plastic container cut the dough in to circles.Transfer the cut dough in to each of the cups of muffin pan,press gently to smooth it out and poke some holes using fork to prevent it from rising.Repeat with rest of the dough and fill rest of the cups.Any left over dough can be used to bake mini fruit tarts. Place the pan in the middle rack of the oven and bake the crust for about 10-15 minutes until the crust is lightly brown. 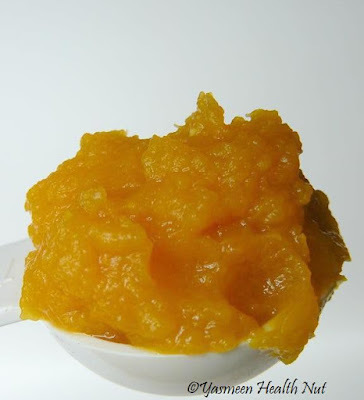 Whisk the eggs or the egg substitute,stir in the sugar and pumpkin puree,combine well. Melt the chocolate in the microwave or in a double broiler with 2 tablespoon of milk until smooth and completely melted.Gently mix the chocolate in the pumpkin mixture ,little at a time while whisking constantly.Pour about 3 tablespoon of filling in to each of the crusts in the pan.Bake about 30-35 minutes.Any leftover filling can be baked separately as pudding. Cool completely and serve.The swirl of Nutella is totally optional,omit it to keep the dessert low in sugar. This kiddie relish is my contribution to Srivalli at Spice Your Life's,First Anniversary with Kid's delight.And to Purva and Priti's Diwali Dhamaka. Happy and Safe Diwali to all the viewers from India Celebrating the festival of lights. Wow! Looks so pretty Yasmeen. How do you do this stuff? Love the pic of the little guy. A great idea! Those must taste wonderful! hmm so litlle master's tarts..good to know that he is whipping up some things in kitchen..Those tarts look tempting..
Wow! 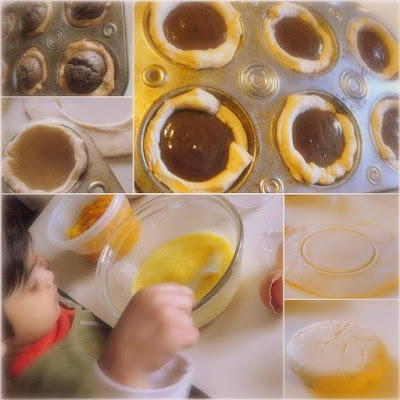 Yummilicious!And I love the idea of using wheat flour for making the tarts.Personally I will go the cornflour way and not use the eggs.kudos to you dear and your little helper. 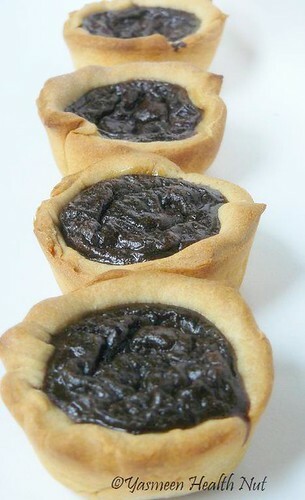 Such a tempting pumpkin tarts with chocolate, am ready to have a tart rite now..droolworthy tarts! Wow they are beautiful, just looking to the pic i am getting hungry for them. I have been staring at these like they are going to somehow jump off my screen - it hasnt happened yet! How sweet..the little chef at work.These sure look like kid pleasers. 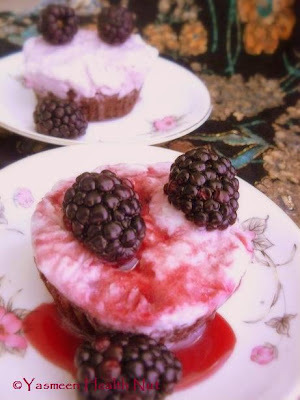 These little tarts are so pretty and look absolutely delicious! A perfect autumn treat! i don't think i've ever tried a dessert with pumpkin and chocolate combined. i do make pumpkin cheesecake every now and then though. 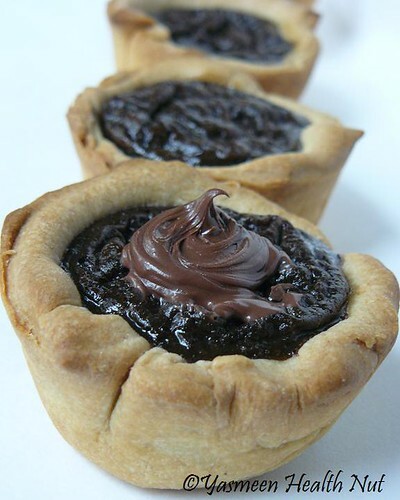 The tarts look so cute and must taste great with chocolate. I've been following your blog from long.I really like the healthy twists to the recipes that you give.Keep up you good work. Thats a perfect recipe for the coming Halloween!! Yay for pumpkin! Your little tarts are so cute and sound delicious! i love pumpkin in any form...and love to snack on the roasted seeds too..
are these pumpkins different in taste from the indian ripe ones? These taste pretty much like the Indian ripe pumpkins. Yasmeen, these are way more than just kiddie treats ... I'd be very happy to gobble a few of these right up! Delicious combo. I love how the filling turned out so rich and dark. 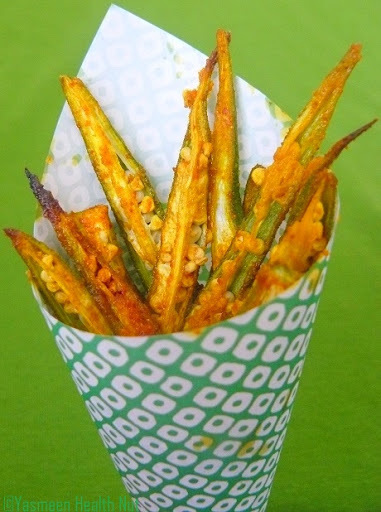 These certainly look good Yasmeen. Love your little helper too! SWEET! Looks gorgeous! Nice click.... You little helper is so sweet..
Love to cook pumpkin but mainly as Indian style veggie never made sweet stuff with it.But yours look cute. New Diet Taps into Innovative Plan to Help Dieters Lose 23 Pounds in Only 21 Days!